And my downstairs bath....I love how it sometimes looks more green, sometimes more blue depending on the light. I found out that RL paint is only sold in select True Value stores and their own stores, so that was a bummer. Lucky for you, I have the formula for the color mixed in Behr paint - which is what I used because I'm cheap and didn't want to pay for RL paint. The colors are nearly identical, no? Obviously, we all have great taste. The colors are nearly identical. Great taste! Love the color... it's so rich and I would for sure do a color like this in our office! Yes yes yes! Thank you so much for posting the colour mix. Ralph Lauren paint is no longer sold in Canada. Greatly inspired by your hallway I have been searching high and low for a colour match for my den. You have made my whole week. Thanks! Beautiful colour Sara! Well done girl. I LOVE this color. It's so pretty. I am actually planning on using it in a mood board soon, for a friend! My brother-in-law and his gf painted their hallway something similar (posted on it yesterday). It's a fab new color! Haha so true! This color is beautiful. It is so deep and rich. I especially love it in your entry way! Can I just say that I love looking in your closet? Who knew that such a tiny room can have such a huge impact. They do look identical!! I was actually thinking that when I was browsing their site this morning. Gorgeous color! I love a bold hue. And thank you for sharing the formula! I love seeing how it looks in different rooms. I painted our kitchen the same as our bedroom and it looks totally different. At first, I thought I may have grabbed the wrong gallon when I was cutting in. haha oh man, I read both blogs and didn't even make the connection - but yes, they are very similar! Love the color - it's such a great shade! 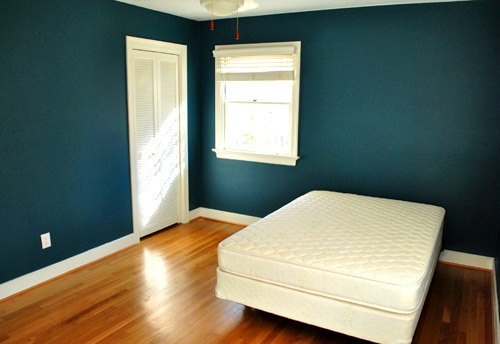 This is the color I wanted when I got to pick out my bedroom wall color as a kid. But my parents wouldn't let us pick dark colors, so I had to downgrade to a gross pale shade of blue. Considering its color-changing qualities in different lights, Reflecting Pool is quite a fitting name for this color. How nice of you to share the Behr formula! Holla! This is the closest I've come to a shout out! Can't wait for my new bathroom... I just ordered the tile today! Teal definitely seems like the it color this season! Trendsetters all of you! Girl, they totally copied you. :) It is a seriously cool color. I may copy you too. But no new projects until I finish some of these old ones! I can't believe such a dark color looks so darn amazing in such a small space! I love it! you were reflecting all sorts of pools before it was cool :) it really IS a great color! Thank you for posting the Behr match! 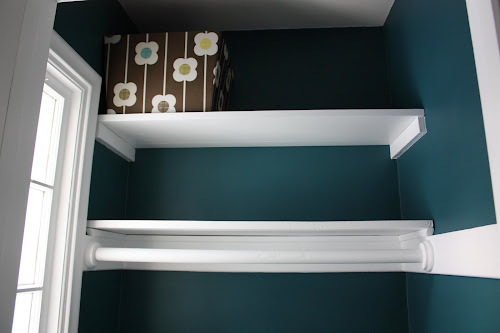 I saw this on YHL yesterday, too, and I have been stalking this color for awhile. I found a cloth napkin in a very close match and I decided I want it in my master bedroom. Now I have to figure out if I should do all walls or just one drama wall...decisions decisions! Good taste! I love the blog world because I get the opportunity to see girls design in a way that I would never think to do! I have always opted for lighter paint colors, but you always go for the rich and dramatic hues...and I'm always so impressed! I can't wait to see what else you have up your sleeve! Wow, I'm in such good company! 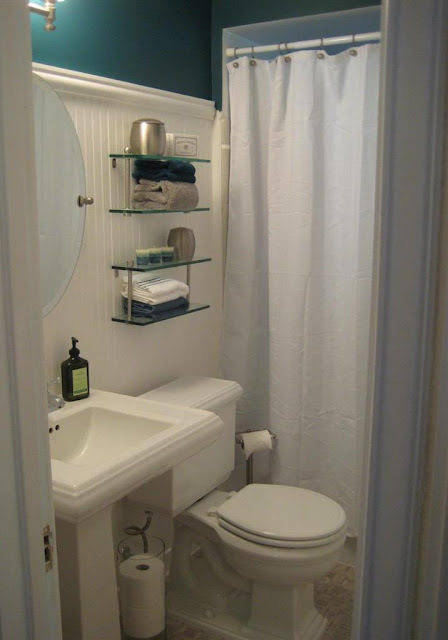 I just chose something similar for my bathroom (white wainscoting was already there)! I have thought the very same thing about it being more blue at times and more green at others. Totally love it! 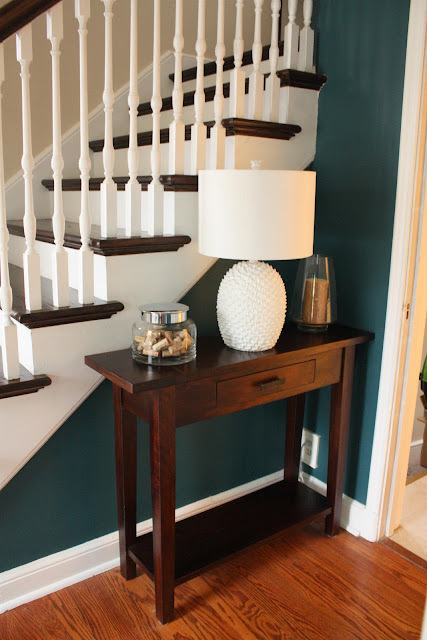 The color looks great in your entry, as well!